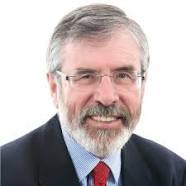 The following – circulated by the Sinn Fein Press Office – is the text of Gerry Adams TD’s weekly column in the Andersonstown News that will be published later this evening. · Unionist politicians ignored the bits that didn’t fit with their narrative and jumped on Hamilton’s claim that the IRA still exists to ratchet up the crisis. · I don’t agree with the PSNI Chief Constable’s claim that the IRA exists – even in the benign way he paints it. The war is over and the IRA is gone and is not coming back. · Sinn Féin and republicans, including the IRA, have taken a series of historic initiatives to create the opportunity for peace; to sustain the process in difficult times and to overcome obstacles. · The Sinn Féin leadership has worked hard to find imaginative and innovative ways to resolve problems. But this problem is not of our making. Sinn Féin has no responsibility whatsoever for those who killed Kevin McGuigan or Jock Davison. The response of the other political parties to these killings has been self-serving and short sighted. · Let me be very clear. Once again. Anyone who breaks the law should be held accountable by the justice and policing agencies. · Let me be equally clear. Enough is enough. Sinn Féin has no special, or particular or specific responsibility to respond to the allegations made about the IRA, above and beyond what I have outlined here. · There is no basis for the charges made against Sinn Féin by our political opponents and if this descends into a political crisis it is a direct result of their stupidity and party political opportunism. · Indeed given the manner in which the debate has descended into personalised attack, invective and Sinn Féin baiting, it is hard to know how the other parties, Executive Ministers or Irish government Ministers would hope to sort this crisis out. · Unless of course, and I accuse them of this, they are motivated entirely by party political and electoral interests. · Sinn Féin will not allow ourselves or more importantly our electorate to be demonised or marginalised over matters that have nothing to do with us. In this case there is nothing more Sinn Féin can do. · Frances Fitzgerald has uncharacteristically undermined her role as Minister for Justice to politically smear Sinn Féin.
. Micheál Martin has also sought to use these killings for party political purposes. He was the Minister for Foreign Affairs when the then Minister for Justice, Dermott Ahern said that the IRA was gone and not coming back.
. In 2010 when Sinn Féin successfully negotiated the transfer of policing and justice with the two governments he was part of the process. He never raised the matter with me once. But now we are on the cusp of an election and Micheál Martin is in electioneering mode.